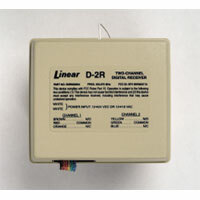 The Model D-2R 2-Channel Receiver is designed for use in security systems and remote switching functions requiring more than one wireless zone or output. Using one multi-channel receiver instead of several single-channel receivers enables the installer to cut installation costs and improve system performance by eliminating RF interference problems present in multiple-receiver installations. The Model D-2R is compatible with standard digital transmitters only. The outputs of the D-2R receiver are isolated dry relay contacts. Dry contacts indicate that the switching contacts are isolated from the receiver’s power supply. The receiver provides normally open and normally closed contacts for each channel. The current rating of each relay output is 1 amp at 32 volts maximum.